Lorena Angulo: Happy Birthday Metal Clay Artist Magazine ! Metal Clay Artists Magazine is celebrating its 2nd Birthday and I am so proud and happy for all the accomplishments this wonderful magazine has obtained. I still remember when I was introduced to the magazine in its first ever sample of the magazine. I was happy to see there will be a magazine fully dedicated to the metal clay community. I was more happy to have met via Facebook Jeannette Froese LeBlanc , she is such a great woman and full of energy. I admire the hard work she and her husband, Carl LeBlanc, have done to keep the magazine growing. When I finally met Jeannette during the PMC Conference in Purdue last year, I could totally see her passion for what she does and how much she loves the magazine. The magazine has a fantastic group of artists that are always helping in putting the magazine together with great articles, projects and wonderful tips, like Margaret Schindel (senior editor) who has done a great job helping with the magazine. The list of helpers is very long and I also THANK YOU all of you for helping keep this great magazine on its feet. The gallery section is always a pleasure to look at, artists from around the world sent images to be included and it is very nice to see the different styles and ways to use metal clay. Here are the issues this wonderful team has put together. I can not wait to see what is coming next!! Every new issue is bigger and full of great information. I am sure you will love to received this great magazine. Here are some links that you can visit and join the groups. 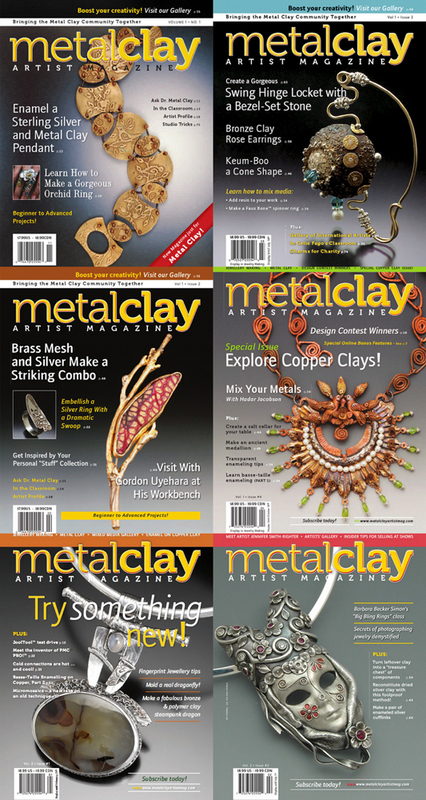 Happy Birthday Metal Clay Artist Magazine !!! Dear Lorena, I already tried silver pmc and I liked the way the pieces looked like. However, I must say that, here in Portugal, its price is huge. I paied, for 16grms, €48,00, versus € 15,00 for the same weight in sterling silver. Of course its much more easier to do some ornaments with pmc. I loved the pieces in the front pages of the Metalclay Artist Magazine you posted. Many kisses. Jeannette: I enjoy helping the magazine in any way I can. You all have done a fantastic job and I admire you A LOT !!! Maria: Yes, it is expensive!! Here a 16grs PMC3 package goes around 38 dollars. I am painting the wood box you sent me with your beautiful heart. I will send you a picture when I am finished. Maria: I think the wood box makes a perfect match for your ceramic pieces!! Kisses and have a great rest of the week my friend! !